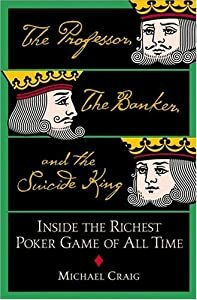 I have just finished an interesting book written by Michael Craig entitled The Professor, the Banker, and the Suicide King: Inside the Richest Poker Game of All Time . 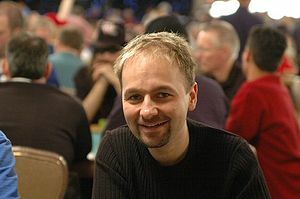 This story details perhaps one of the biggest cash games ever played, in excess of $20 million dollars and these events occured between 2001 and 2004 between some of the best professional poker players in the industry and an amateur, a banker by the name of Andrew “Andy” Beal. Before reading the book, I had not heard a word about this event and yet it involved almost all of the poker superstars that I follow and read about. The cast of players included the likes of Doyle Brunson, Ted Forrest, “Chip” Reese, Todd Brunson, John Hennigan, Jennifer Harman, Chau Gang, Howard Lederer, Bary Greenstein, to mention a few. For the most part, these pros would play heads up or one on one with Andy Beal. These were his demands and he made them so that he would not feel that he would be cheated. He tried to make them play in games with the blinds being at least $100,000/$200,000 or higher in order to get the pros off of their comfort levels. Overall this book gives a good insight into the type of lives and thinking the poker pros use on a daily basis. This was a real eye opener for one who might aspire to reach their lofty ranks. You better bring plenty of gamble to the table with you and be prepared to lose as well. This was a hard book for me to put down. I finished it within a week. Do you read any poker books that are about the history of the game and about the players? Small Ball Poker – a tourney strategy! I have just finished reading Power Hold’em Strategy written by Daniel Negreanu. He has five other contributors including himself in the book. There is something there for both the amateur and the semi-pro as well as secrets that even the poker pros might be able to use to increase their wins. This book is intended for those players that participate in playing tournaments, both online and in a casino. On the surface, “small ball” is about winning small pots and building up your stack. It is about avoiding the all-in crippling confrontations that face all of us from time to time. He does not say to totally avoid those situations. But it is best if you only go all-in when you have the “nuts” or the best hand. While his style of play was for tournaments, I have tried it in cash games with limited success. This is certainly a book that belongs on your bookshelf if you play lots of tourneys. Do you already play using “small ball” techniques? Registered to play in the PokerStars WBCOOP! For the last week I have been playing mostly Pot Limit Omaha Sit N Go’s on CLubWPT.Com, a site I am affiliated with. The format is fairly simple. The buy-in is 25 TP’s or tournament points. The prize is 250 TP’s divided between the first and second place finishers in the amounts of 150 and 100 respectively. 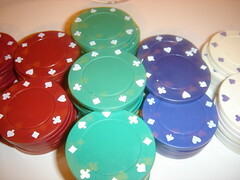 Each player is given 1,000 starting chips. The blinds and antes increase every 10 minutes. I have played over 20 tournaments so far and have started placing in either first or second place in the last 6 Sit n Go’s. I discovered that most of the players were very wild, betting and raising the pot with hands that had a lot of drawing potential but not necessarily the best hand. I found that unless I had AAKK or 8877 double suited, meaning that the AK’s or 87’s were in the same suit, I could just wait until everyone else lost to the chip leader. Then I could play heads up and either win all of his chips or finish in second place. This stratagem has worked very well, except for the last game I was involved in. There were three of us left and the short stack was sitting out. The chip leader had about 7,500. I had about 1,750 and the short stack had about 1,250. I folded most hands losing the blinds and antes to the chip leader. I was able to keep my chip level from going below 1,000. Basically, Pot Limit Omaha is considered a drawing game, in that your hand values change from pre-flop, to flop, turn and river. To be successful at PLO, you need to know when to call, fold or jam it, raising the pot. I had forgotten all that in one hand when I had pocket Kings with a Jack and an eight. This was not really a good hand and yet not only did I call the raised pot, I re-raised and was all-in in just two clicks of the mouse. As I said, I had KKJ8. My opponent had 6795. The flop was 5 7 3 with the turn a 7 and the river a 9. I went out in third place with the player that was sitting out with only 75 chips, winning second place. In just one brief hand, I had forgotten my original plan and caved in to the action of the game. Had I done nothing more than folded every hand, I would have finished in second place. Do you have a game plan when playing Pot Limit Omaha? Do you ever get impatient with waiting for the best hands to develop? How do you play PLO? I have been having a heck of a time lately in tournament play, either MTT or single table formats. I had forgotten that I need to give myself a chance to win or at least finish well. I had gotten into the bad habit of trying to shove my chips all-in to win a pot by force. Of course I am always called by someone else that has a better hand or a better draw and more chips than I had. Busto! I have just started reading Power Hold’em Strategy by Daniel Negreanu. This book was a Christmas gift from my wife, Diane, and it could not have come at a better time. There was a time when I would enter a small MTT tourney with the expectation of placing in the top 5. But of late, I seemed to have lost my rhythm or tempo as a twitter friend of mine called it. It seemed that all of my moves were the wrong ones. So I went to playing mostly cash games instead. Then I hit the brick wall there as well. Power Hold’em Strategy is much like Doyle Brunson’s Super System 2: Winning strategies for limit hold’em cash games and tournament tactics in that there are contributions from well known and successful professional poker players. Featured in this book are: Evelyn Ng, Todd Brunson, Erick Lundgren, Paul Wasicka, David Williams, and of course, Daniel Negreanu. The difference with Daniel’s book is that it features the top young guns of poker. The book discusses image, ideas and tips and Daniel shares his “small ball” strategy. I have already started using many of the suggestions I found in this book and they have helped to get me on track in my tourney play. Last night I was in a satellite on ClubWPT.com. 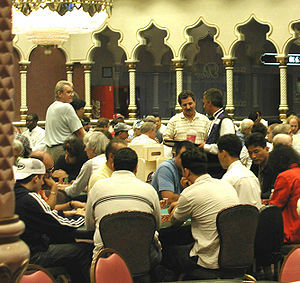 The prize was a seat for a tournament on January 31st at 9 pm. The ultimate prize is a paid WPT Boot Camp training session. 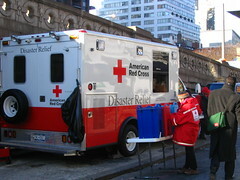 There were 110 entrants to the event. Each of us was given 1,000 in chips. The blinds and antes levels increased every 6 minutes. By the 35th hand, I managed to grow my stack from the starting size of 1,000 to over 5,100 and was in the top 3 when I overplayed Q9 off-suit. The flop was 6 5 J. I bet out 600 and was called. The turn was a Q, giving me top pair. I bet out 1,260 and was re-raised to 2,250. Without batting an eyelash I insta-called. The river was a J and my opponent went all-in and I called, leaving me with 150 in chips. All I had was the pair of queens with the board having a pair of jacks. My opponent turned over his pocket pair of jacks, giving him four of a kind, or quads. Even though I had only 150, I decided to wait for a good hand before attempting to dig myself out of the hole I had made for myself. Two hands later I looked at pocket Jacks, went all in for my remaining 150 and won 600. Four hands later with AJ, I was able to go from 500 to 2,200. With a J10 and a good flop, my chip stack went up to 4,925. My chips went as high as 9,500 and I finished the tourney in 7th place with 5,345 chips remaining. Along with nine other players, I had won a ticket to the 1/31/10 WPT Boot Camp event on ClubWPT.com. This all happened because I did not give up and had some luck as well. Do you ever give up when you are short-stacked? Do you just throw your chips in and hope for the best? How do you handle downswings in an event? I signed up for a two week trail subscription on ClubWPT.com and decided that I liked the site. Based on what I saw, I also decided to be an affiliate member as well, meaning that I earn chip money if someone else signs up with ClubWPT using the ad on this site. The software reminds me of the older UltimateBet site now known as UB’. The table interface and options are the same as the older UB software, including the detachable chat, a feature that I enjoy. For $19.95 a month I get a minimum of 500 tournament points per day to be used for buy-ins for Sit N Go’s and scheduled tourneys. Just today, there were over 50 events available with buy-ins ranging from zero to 400 points with most of the events priced at 25 points or less. You can earn points that can be used to play more games. This site is geared up for the player that aspires to play mostly in tournaments. The “cash games” on this site are using only “play money”. Based on this weeks schedule, there are daily $1,000 prize tourneys with top place being paid $150. There are also events that can win you a seat to an upcoming WPT event or even a spot at a WPT Boot Camp! There are even Sit N Go’s with buy-ins set at 10, 25, 100 or 250 points. The point games are either No Limit Hold ‘Em or Omaha Pot Limit. The “play chips” games selections include those and Stud, Stud 8/b, Triple Draw and Omaha H/L. The best part of the site is that it is an absolutely legal online poker site for US citizens.